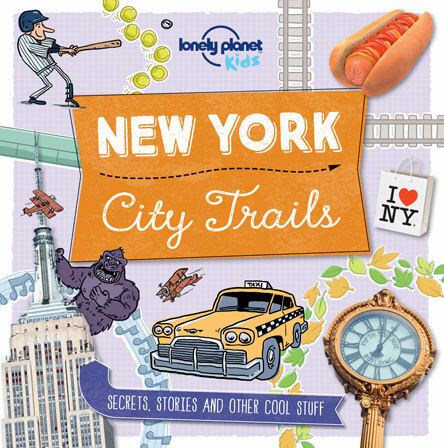 Summary: Marco and Amelia, the Lonely Planet Kids, have created nineteen kid-friendly trails around New York City, including Urban Jungle (where to find animals), Game On (sports and games), and Movie Magic (spots you might have seen in the movies). Each trail gets four pages, with two attractions per page. There’s a picture (photo, drawing, or a combination of the two), and a brief description of each site, filled with facts that will appeal to kids. A very complete index rounds things out. Enjoy other books in the series on London and Paris. 104 pages; grades 3-7. Pros: What a great way to get your offspring involved in planning a trip! Every one of these trails would make an unforgettable weekend for children and parents alike. The busy, colorful format is sure to appeal to young readers. Cons: It would have been nice to include some additional resources, especially websites.